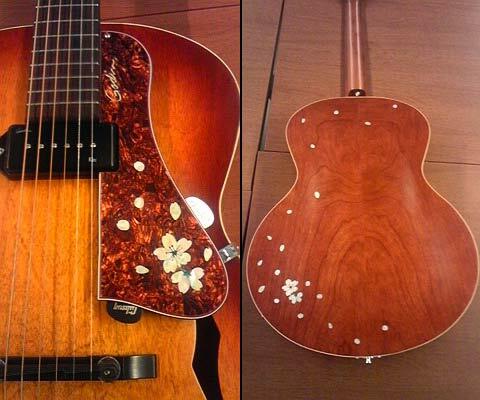 Thanks for the inlays ! 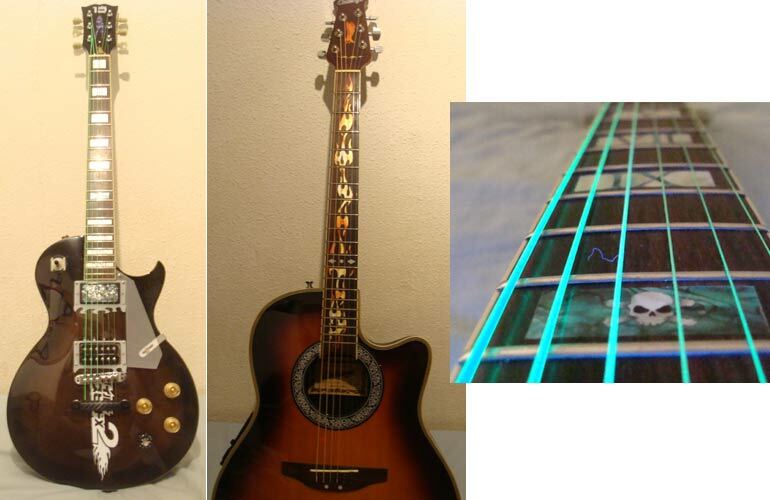 By the way, originally my guitar had only the 12 fret off set dot inlay so i had no use of the brown doted inlays supplied with the shark fin inlays. 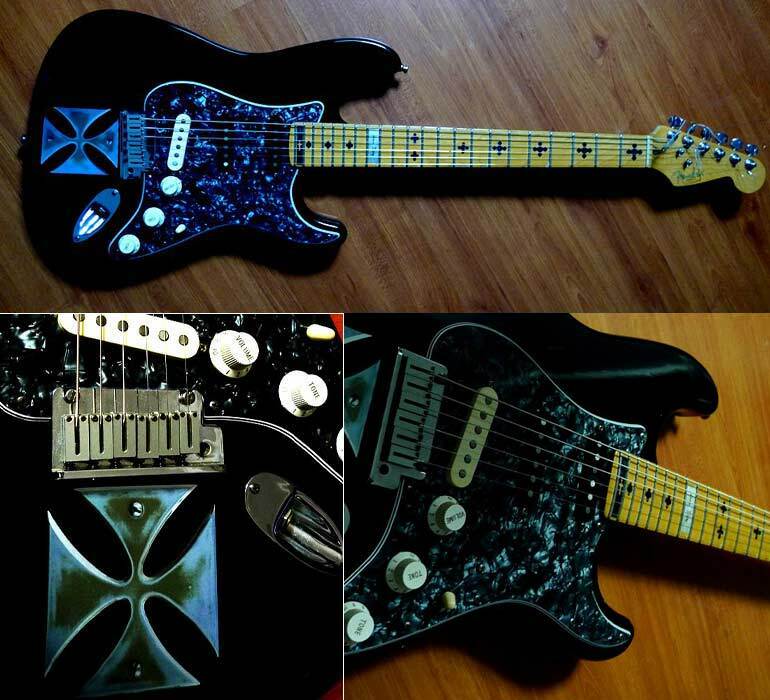 Please consider selling the shark fin inlay without the extra brown dots. Feel free to post the attached photo. 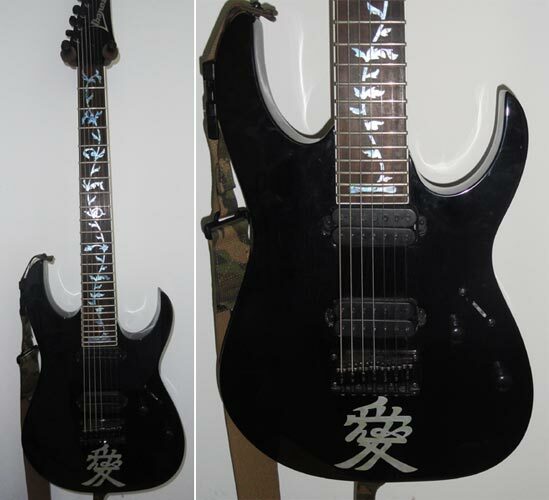 It's rarer "Faded Balck Color" on body of Ibanez RG. I'd like to say thank you for your suggestion. It will be a real pleasure for me to deal with you again!! 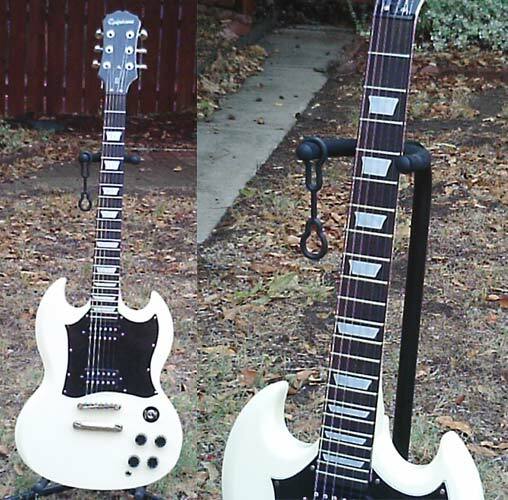 Dish Fret Makers suits best to Epiphone SG. 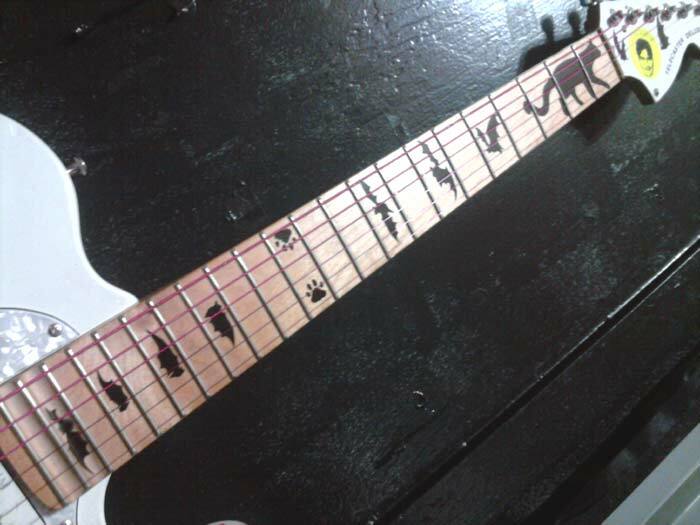 I wanted a cat inlay on my telecaster for my cat I no longer have. 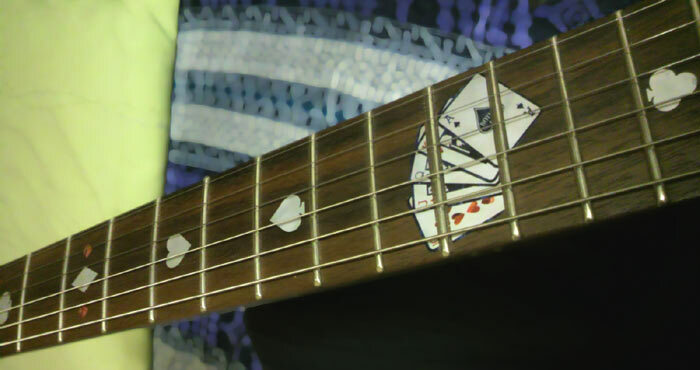 Cat Foot Printed & Bat Fret Markers on Telecaster Deluxe. 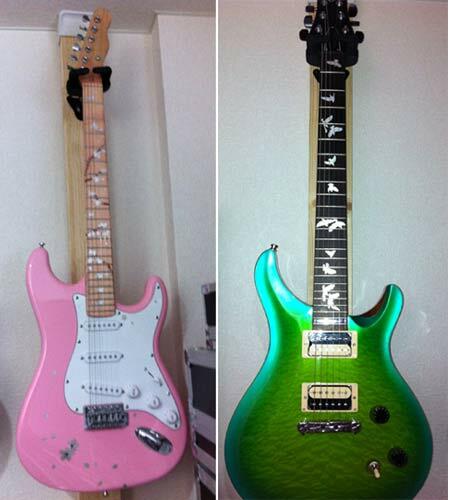 They fits with white bosy, pearloid pickgurd and maple fretboard. 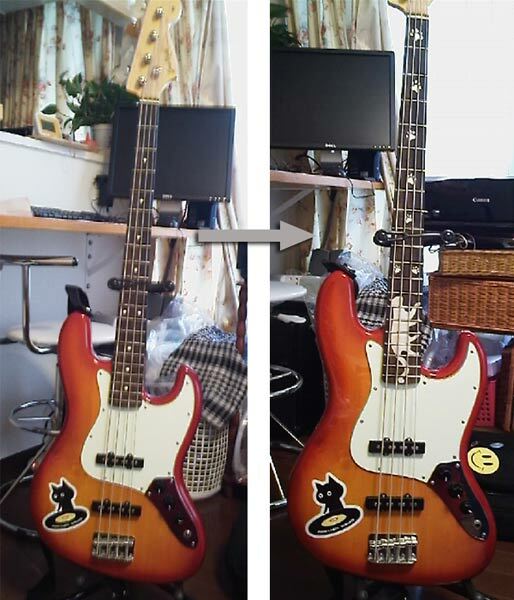 Just to show you how happy customer is with the custom inlaystickers you did for him. He has also bought many inlaystickers too. I forward you his emails and mine. Have fun reading, LOL! These pictures come from Singapore dealer. I'm very happy to be of service. 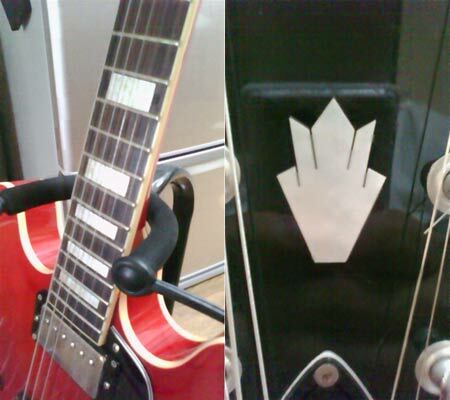 Inlay stickers match all guitars well. 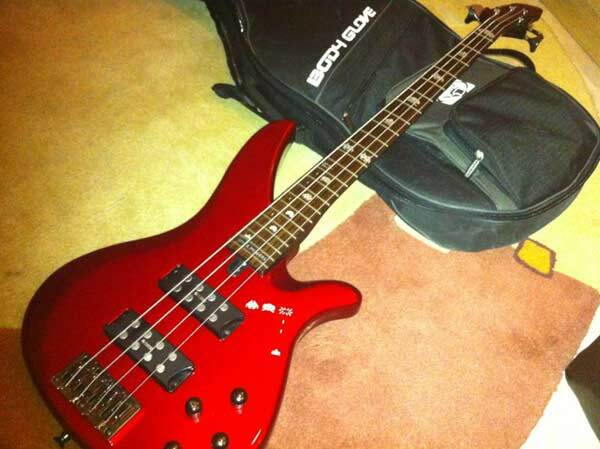 Here is my seven-string Ibanez RG7321. 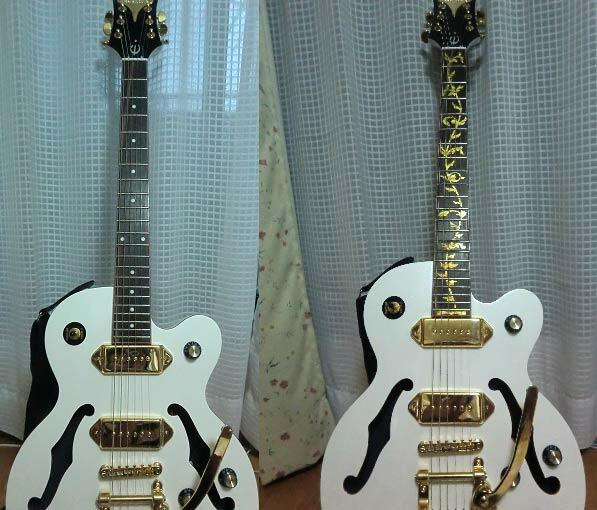 After a few months of owning this guitar I got bored of the regular dot inlays and decided to search for some different inlays. 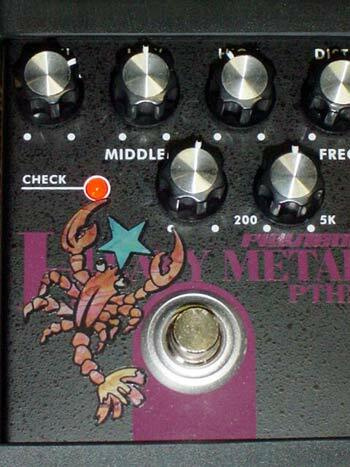 At first I thought of getting real inlays, but come to find out they are very expensive and not worth it. 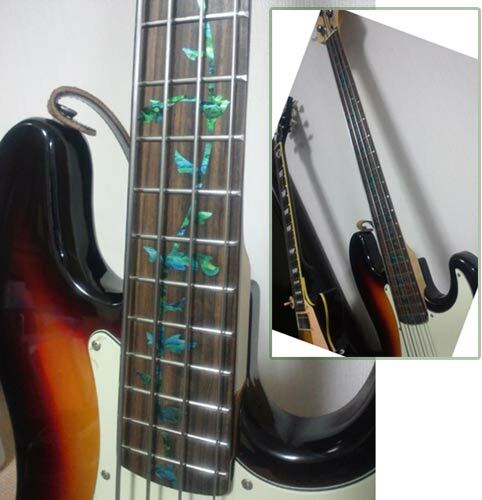 So I found the great invention of inlay stickers and decided to order the "Tree of Life" inlay and the Kanji decal "Ai" for the body. 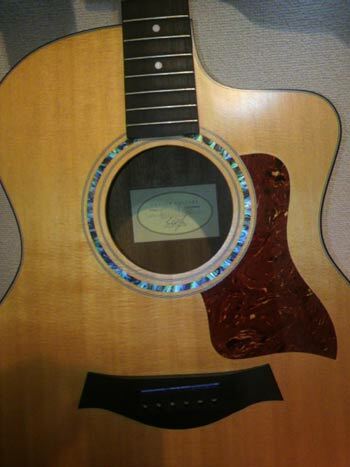 It was amazingly easy to put the inlays in. The result was beyond my expectation. arigato! I'm glad you liked it! and I'm very happy to hear your comments. Yars!! 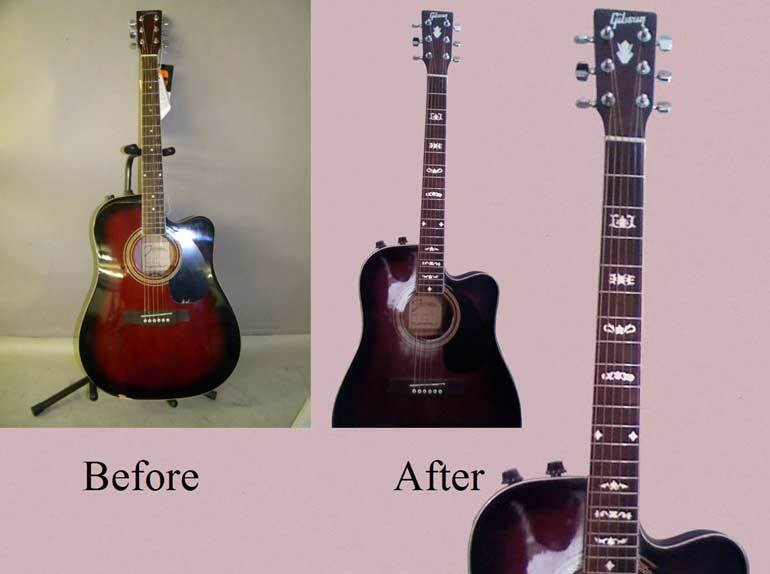 It is the Inlaystickers which customers can enjoy easily and can modify. 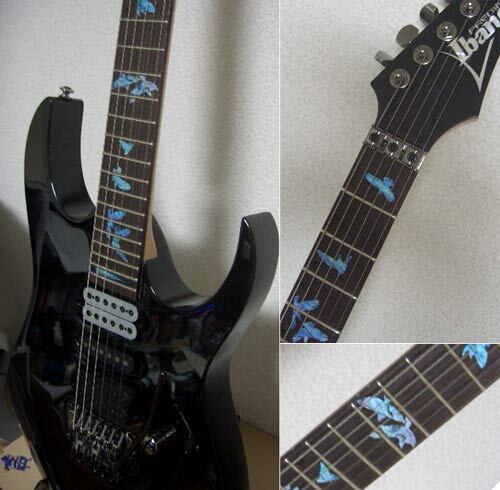 It looks great with your Ibanez RG7321. Thanks for the stickers ! here are the photos of the finished product ! I'm very happy to hear you liked it!! This gear is the breathtakingly beautiful. 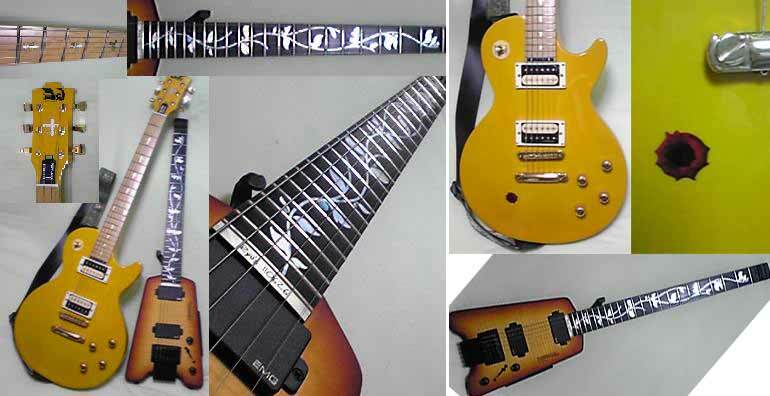 Especially, that's cool flame top, gold parts and binding of body. 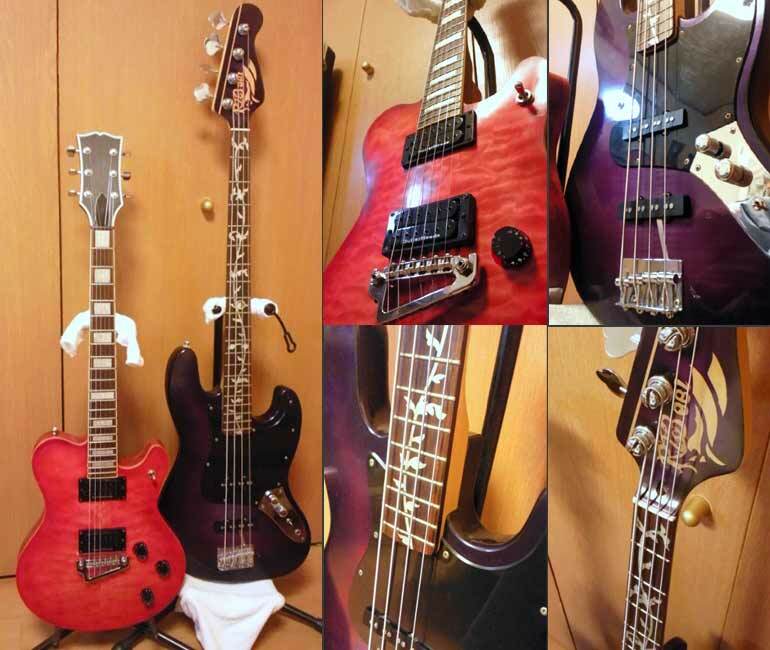 Warmoth is very famous parts shop for custom guitar. 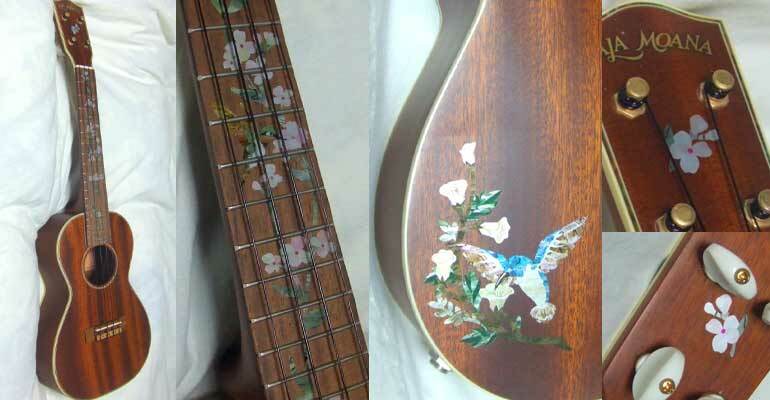 "Birds/Ocher fret makers" fit perfectly in this guitar. 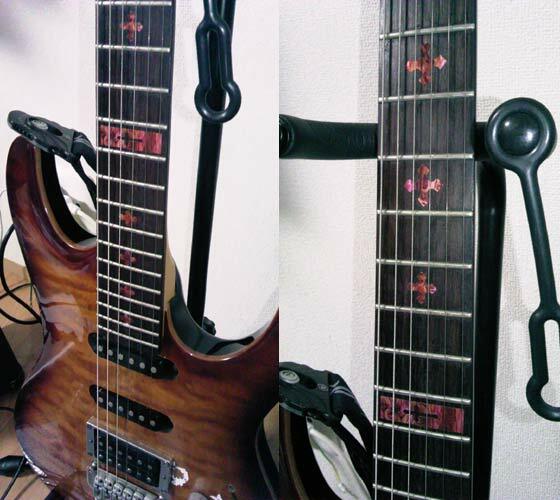 It fits perfectly in your Ibanez RG. 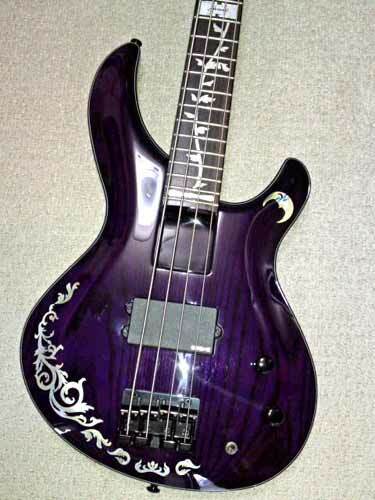 - Now with your “tree of life” fretboard decal. This changes the Craviola into a Cravi ? OHHH ? la!!!! Thanks so much! Wow! Vintage Giannini Craviola Brazilian Classical Guitar!! Paulinho Nogueira and built by manufacturer Giannini. 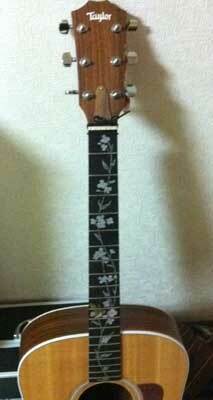 Tree Of Life/Ocher, Rosette, and Strap fit perfectly this guitar for a very good feeling! 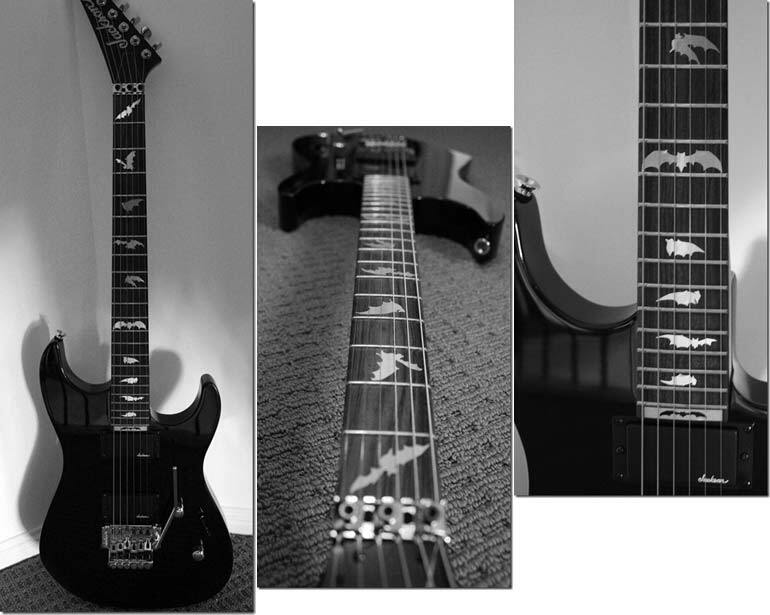 I received these metallic bat inlays in just over a week. 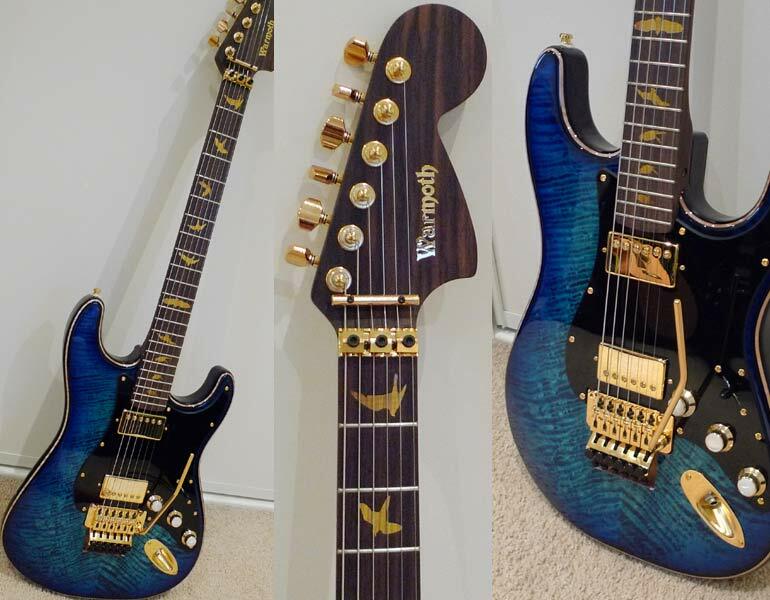 They make my Jackson Dinky JS30 look amazing. 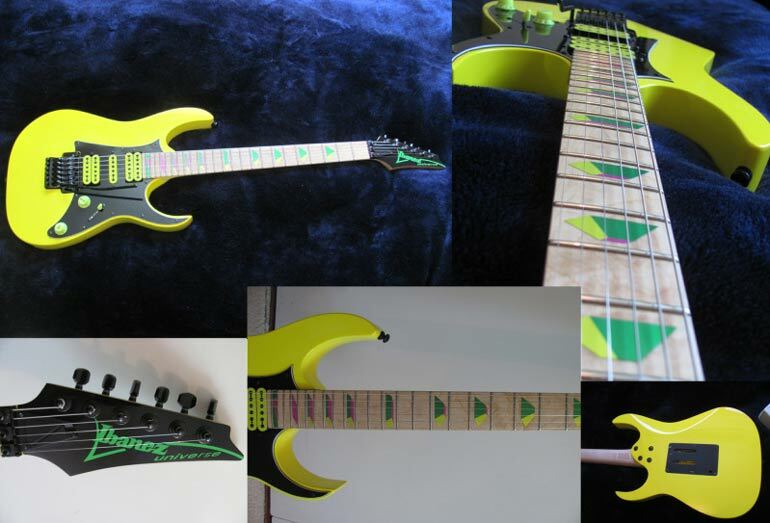 Bat Inlays fits perfectly with the colors of your Jackson guitar. 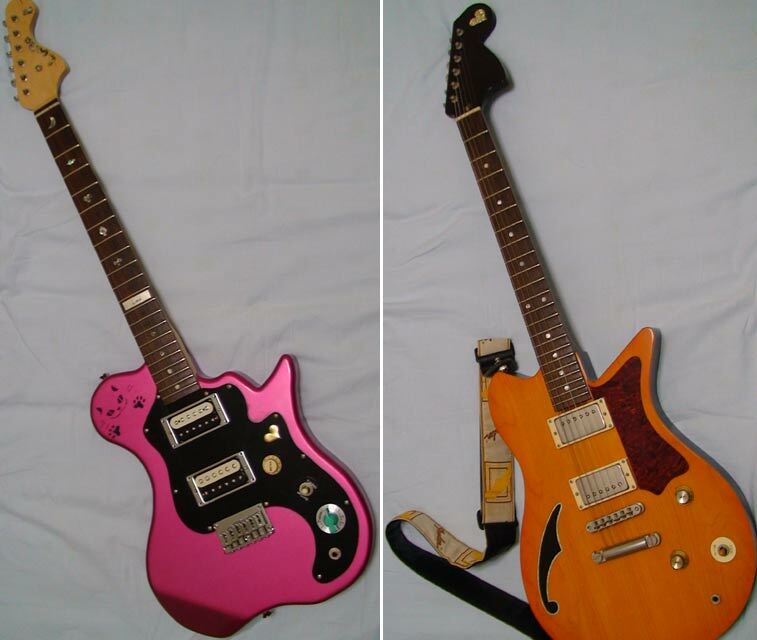 I just wanted to show you a recent picture of how they look now. They are still in GREAT shape! thank you very much, they get people thinking they are real and are very good looking. I'm very glad it will bring you continued enjoyment and satisfaction. 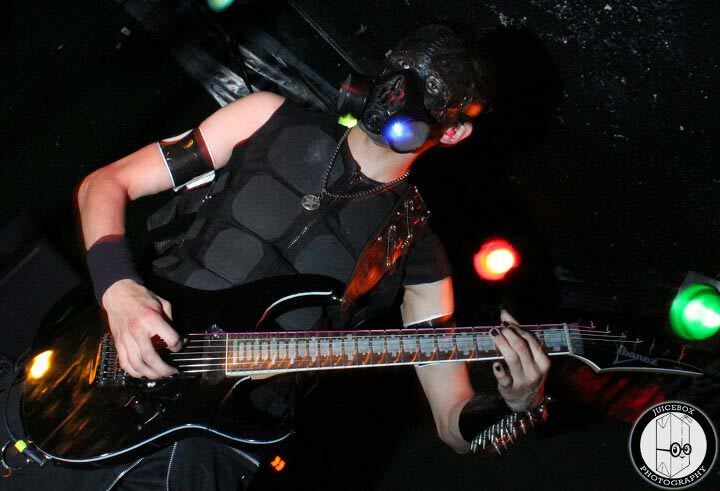 This fret makers/ Human Spine is cutom order. Please take a look picture #257 / There's more it / Page 7 in cutomer's Gallery. 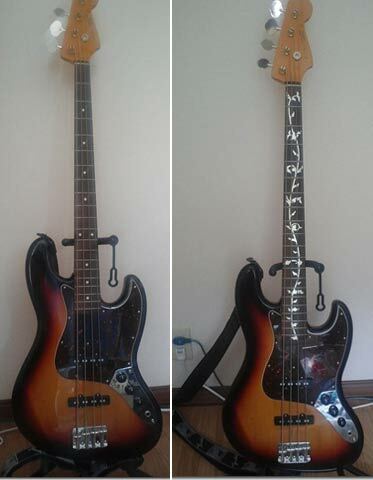 Here's my Fender american standard with a new pickguard and your inlay stickers. Am very happy with how it came out. It looks good! 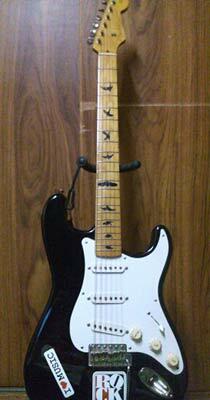 Mica Pickguard,Maple Finger Board, And Black Body. "Pick-Up Sticker" on bridge-side pick up. This is one of the pictures I intend to use as described. These are the pictures I intend to use for my shirts along with the by-line for Jockomo. 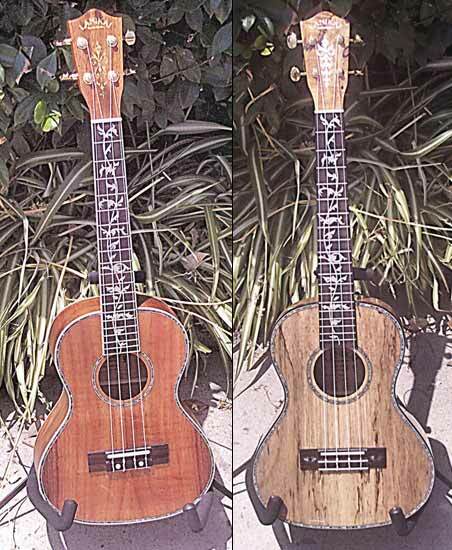 These Tenor Ukelele are Lanikai and SMT. 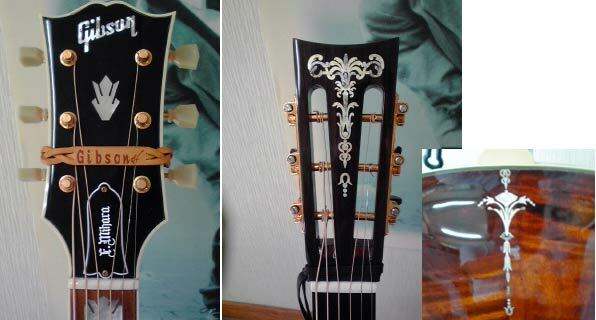 It looks good in that Small Toch on Headstock and Tree Of Life on fingerboard. Chinese Dragon Dance. Great stuff! Look! 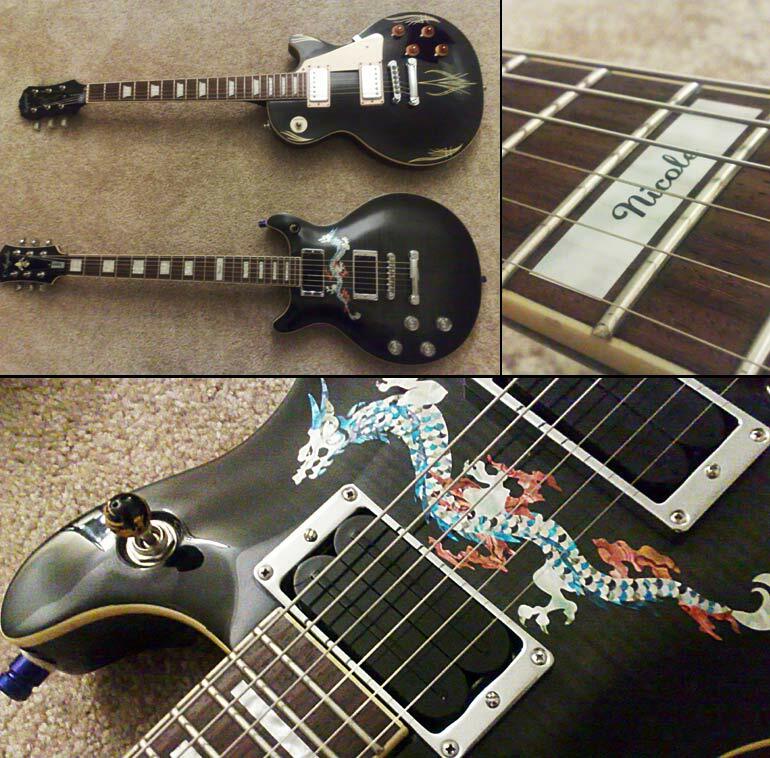 "Top of the selector switch"
Definitely, it seems the dragon is chasing it. To do it like that, he cut off neck, head, legs and tail for improving angle. I hope to deal with you again!! 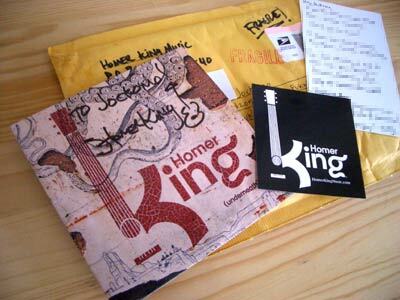 Just wanted to tell you thanks for the great inlays and fast shipping. 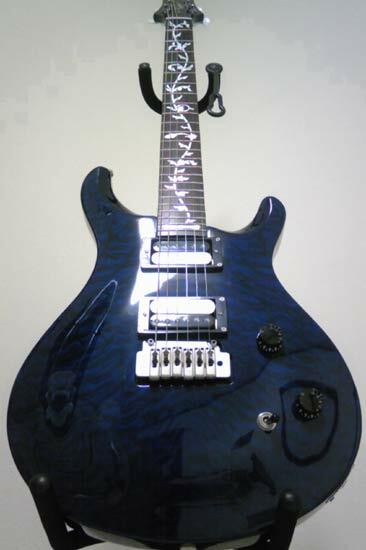 I'm attaching a picture of my guitar. 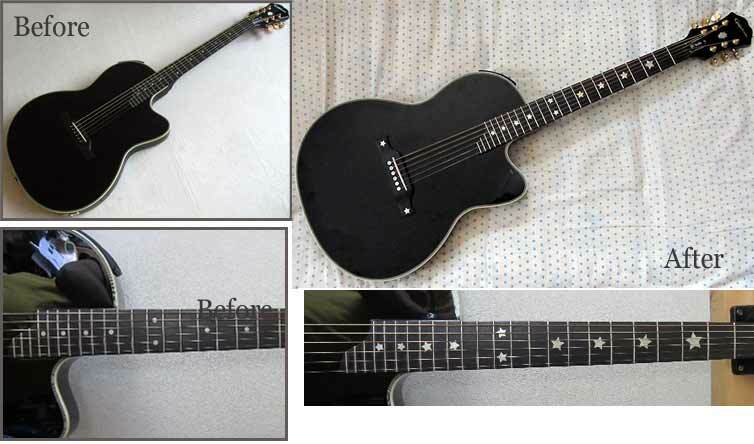 Is this Epiphone PR-4E Acoustic?? 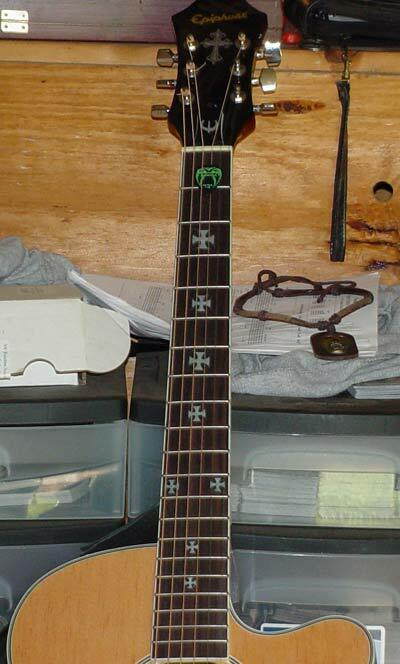 Iron Cross Fret Makers and Traibal Cross fit perfectly into it. Thank you for sending pictues. 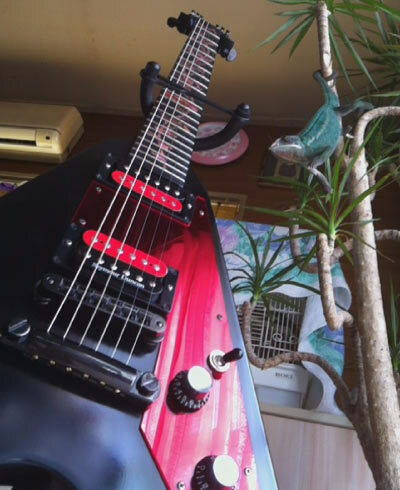 Space Invaders Fret Makers fits your YAMAHA/Bass RBX374. A part of Space Invaders installed on the body is cool!!!! 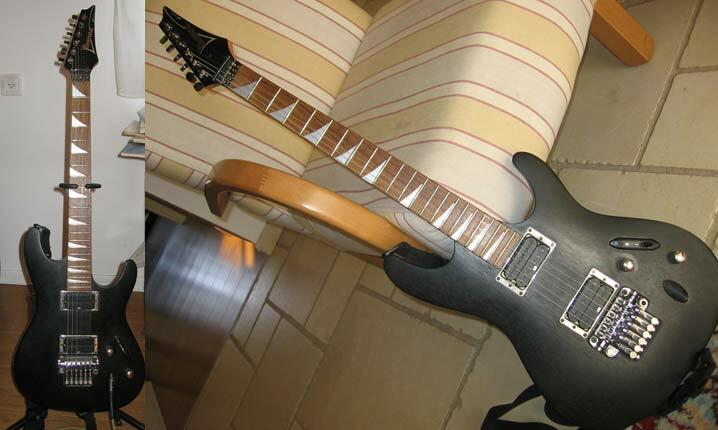 As promised here is the before and after picture of my guitar with the new fret markers. It looks much better in my hands. 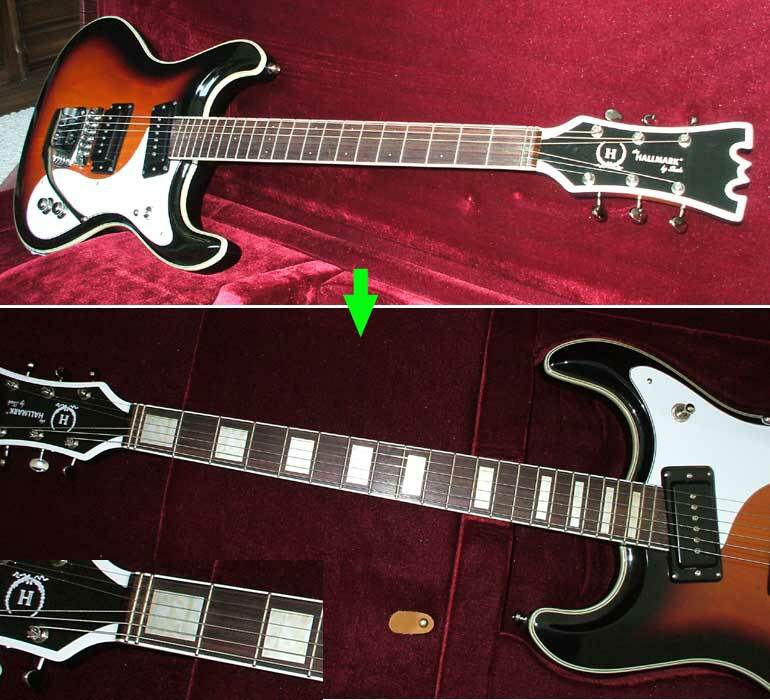 By the way, what brands are this guitar?? Just got them on yesterday. Looks pretty cool I must say. Thank you for you sending pictures. 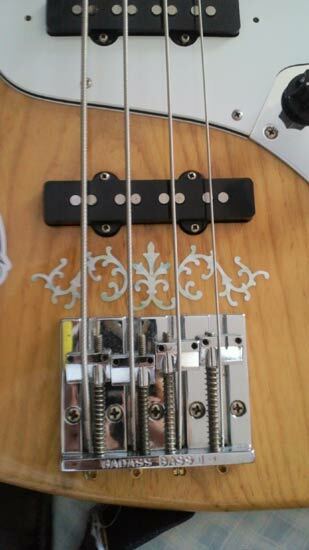 Block Inlaystickers(AWP) fits perfectly in Hallmark 59 Custom Mosrite Model. His band "Roger & The Wraybands " is so cool, I love it!!! Please check the following homepage. They play a lot of Ventures tunes.